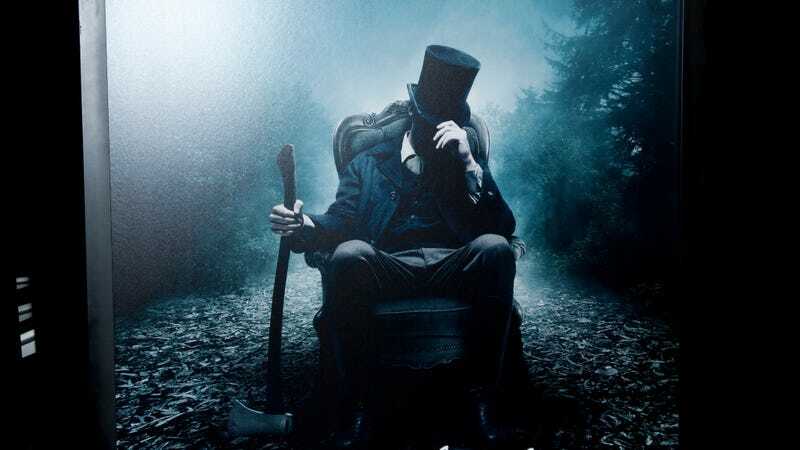 Few films captured America’s abiding interest in presidential exceptionalism, blood-sucking monsters, and watching those two concepts wail on each other with an axe more fully than 2012's Abraham Lincoln: Vampire Hunter. And lest you think that said film’s legacy stops at depicting the battle of Gettysburg as a conflict between racist vampires and Union soldiers, or at suggesting that Abraham Lincoln’s son, William—an actual human child whose death devastated Lincoln and his wife Mary in the latter years of the Civil War—was murdered as part of his vendetta against the undead, well, NBC has got some news for you. Specifically, Variety reports that the network has put into development The Last American Vampire, an adaptation of author Seth Grahame-Smith’s sequel to the novel version of AL:VH. The story centers on Lincoln’s old Blade-wannabe buddy, the vampiric Henry Sturges, who apparently wandered through most of the formative moments of American history like some kind of blood-guzzling take on Forrest Gump. Needless to say, the network looks to be turning that admittedly ambitious concept into some kind of supernatural police procedural, with Sturges teaming up with a young FBI analyst in order to solve a bunch of crimes. It’s honestly pretty disappointing, especially since the people putting the concept together seemed to have failed to grasp that the stupid-interesting parts of the original book were the Abraham Lincoln bits, not the vampire hunter stuff; otherwise, you might as well just be doing a modern reboot of Forever Knight. (You thought we were going to go Angel there, but no, we swerved.) Hopefully we can get at least a few Founding Fathers or other noteworthy American leaders showing up as vampires (or possibly Frankensteins) or otherwise, what’s the freaking point? Abraham Lincoln: Vampire Hunter just making things up now, adds Rufus Sewell as "lead vampire"